It’s Day 4 of Kids Week! 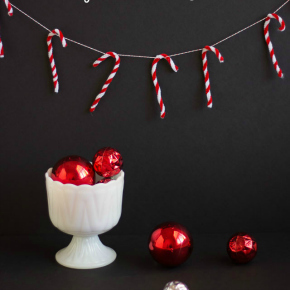 If you’re in search for a unique kids gift for the holidays, I have a simple idea for you that they are sure to love. 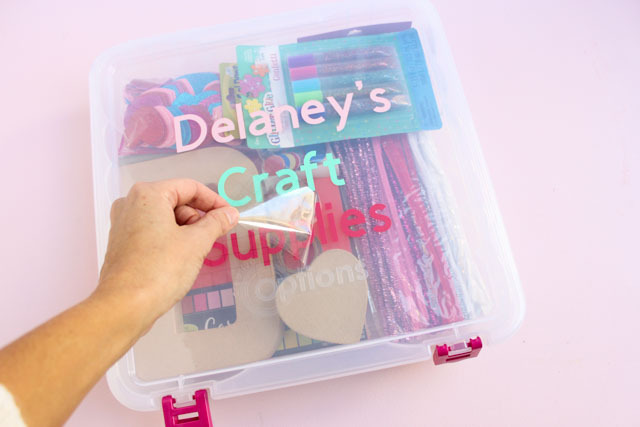 Make them their own personalized craft supply box filled with fresh supplies. I haven’t met a kid (or adult) who doesn’t love a shiny new set of pens, paper, or paints in rainbow colors. 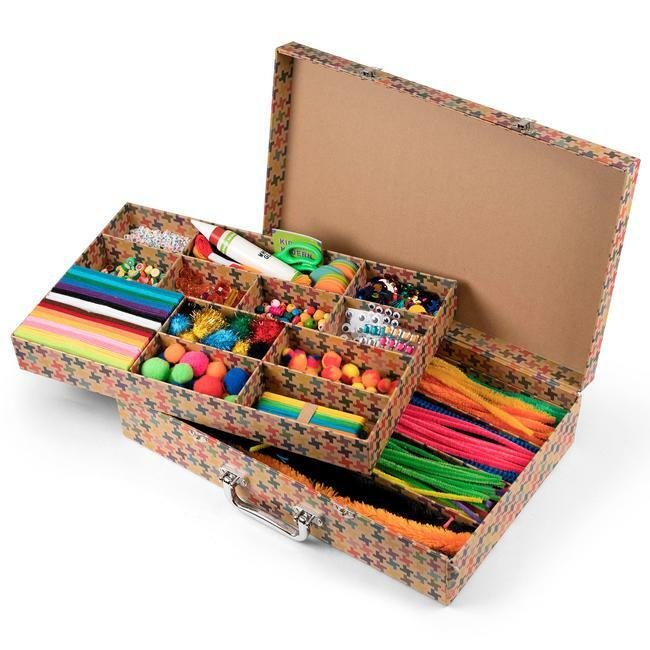 The beauty of this craft supply box is that you can fill it with whatever you think the child would enjoy. Stella and Hazel help me create this one for their cousin’s birthday. 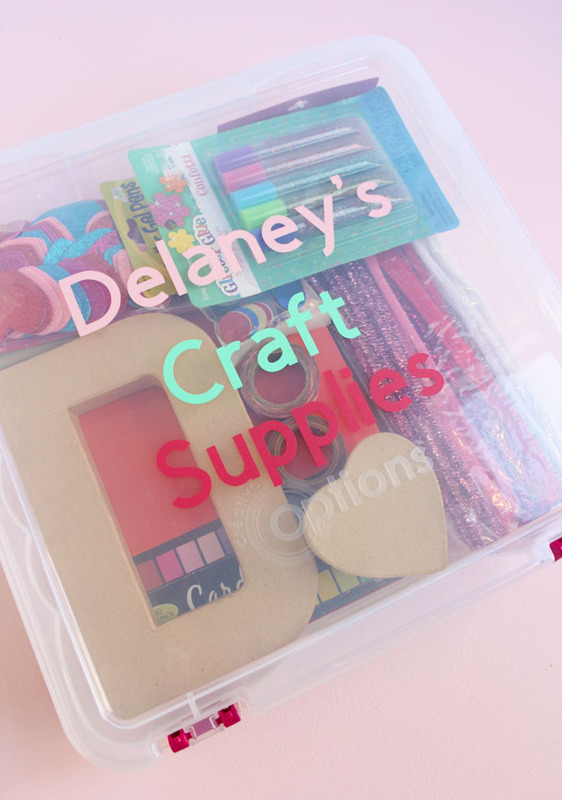 We started with this awesome clear project box and used my Cricut to personalize it with her name. Read on to see what we stocked it with! 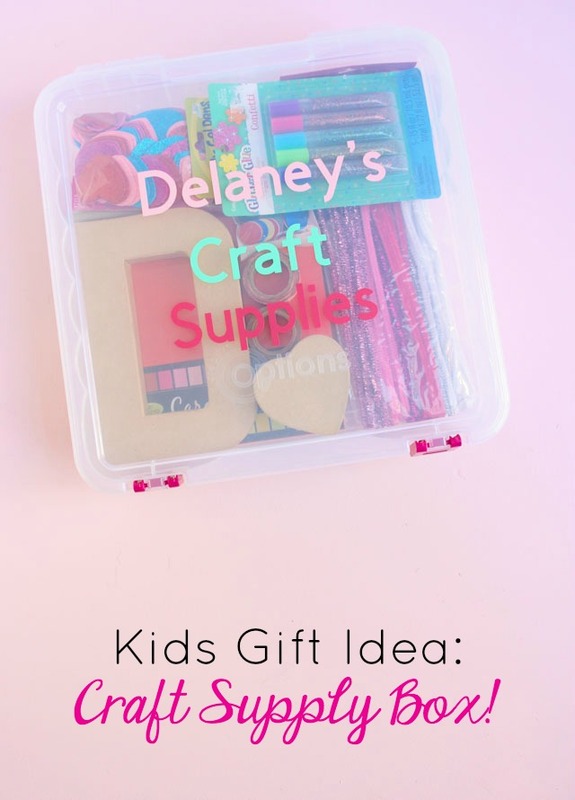 Project Storage Box – Giving the child a box to store their supplies in is a great place to start. I absolutely love this sturdy 12″ by 12″ clear project box with handle. It is fun to be able to see the supplies inside! I found this one at Hobby Lobby and used my 40% off coupon. Paper Mache Letter – As you know, I love any kind of paper mache product because they are so easy to embellish with paint, glitter, or decoupage. 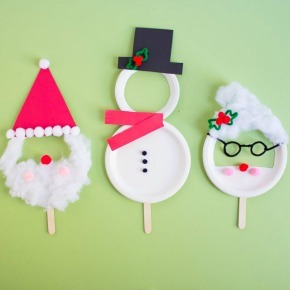 They are especially great for kids’ projects because they are inexpensive and come in so many different shapes. 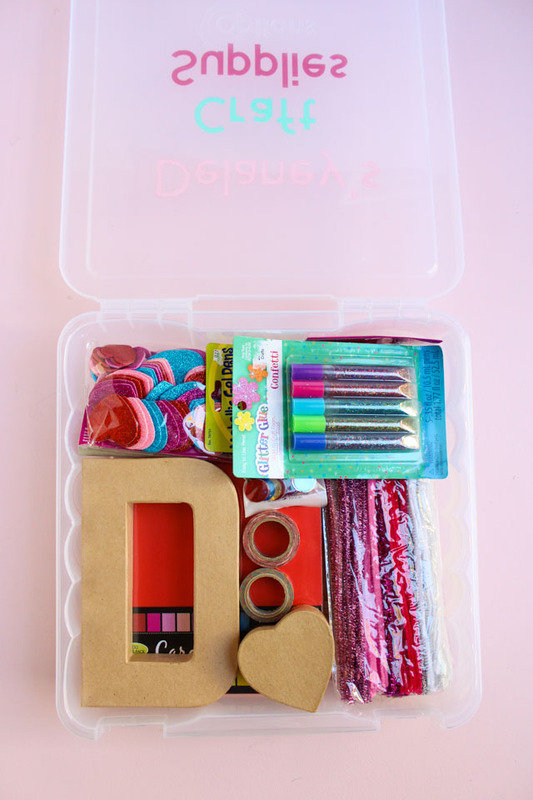 We gave Delaney a “D” to personalize for her room, and a little heart box to fill with a treasure or two. Washi Tape – This pretty tape comes in every design and color under the sun. 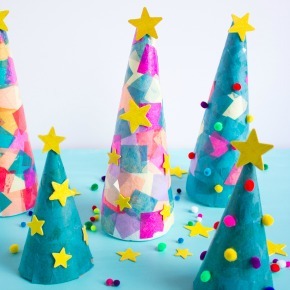 Kids love adding it to just about everything, and it is perfect for decorating your paper mache shapes with! I like it because it is easily removable and re-positionable if needed. 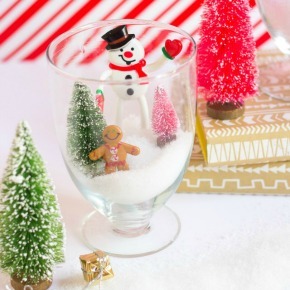 Glitter Glue – So much less mess than real glitter, and (almost) as fun! 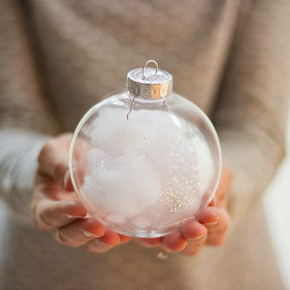 Adds a pretty sparkle to any craft project. Gel Pens – Include something to draw with in your craft supply kit, whether it is markers, crayons, colored pencils, or these gel pens that my daughters love! They have a pretty sparkly sheen to them. Cardstock – Colored cardstock is a sturdier alternative to paper. 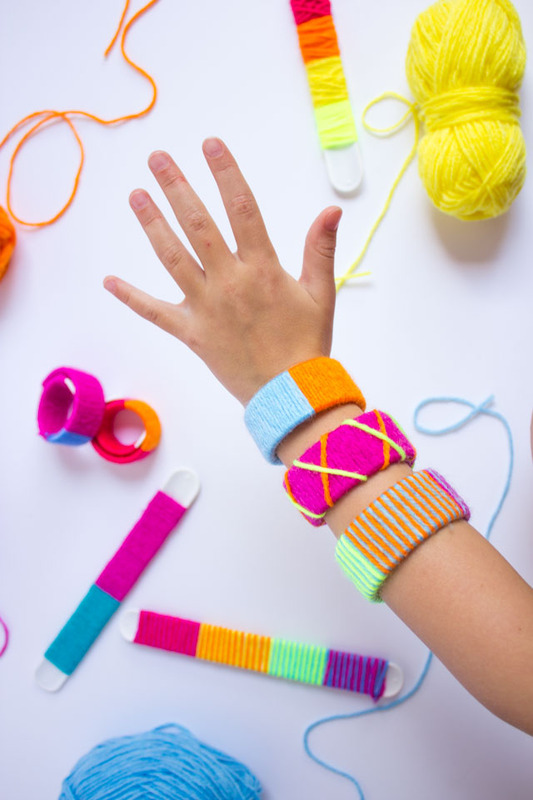 I love Astrobrights‘ bold colors, which are perfect for kids crafts! Stickers – Is there a kid on this planet that doesn’t like stickers? They are certainly a staple in our house. Stella and Hazel have a shoebox full of them that they often dig through for craft projects. For Delaney’s box, I included some glittery heart stickers. Colorful letter stickers would be another great addition for crafting. Pipe Cleaners – Also called chenille stems or fuzzy sticks, these are a classic and can be bent into so many fun designs. Pom Poms – (Duh!) 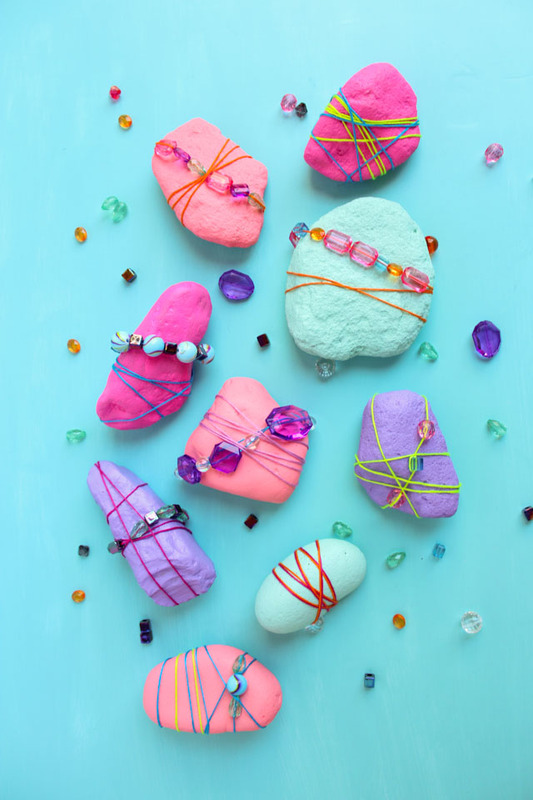 It is actually shocking that we didn’t include any pom-poms in Delaney’s craft supply box, because as you know they are my ultimate favorite craft supply! 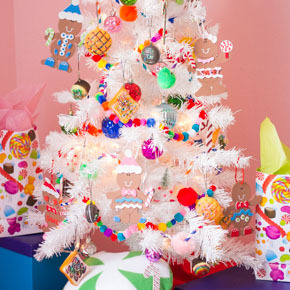 These glitter pom poms are especially pretty. Picture Frame – I love these wood frames for kids crafts. 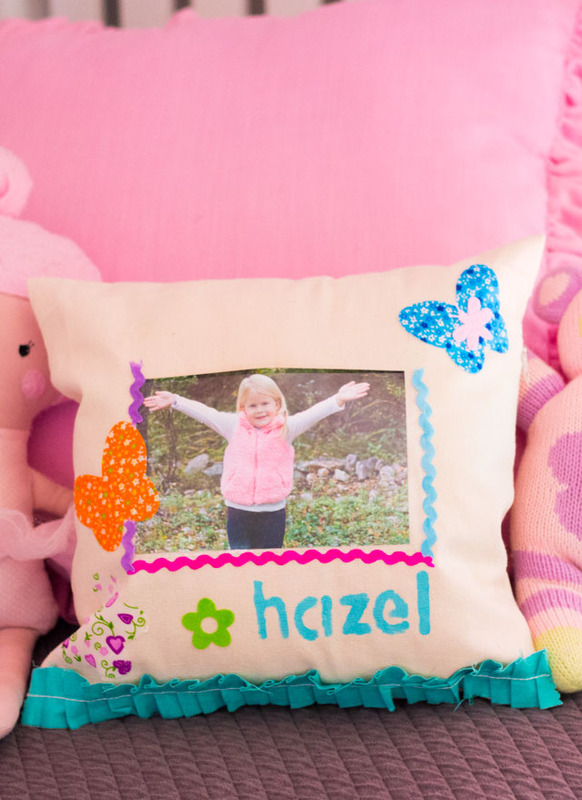 Not only can kids use them to showcase a drawing or other piece of art, they can also turn the frame into its own work of art by embellishing it with paint, markers, stickers, pom-poms, etc. Mini Easel – These little easels are also a fun way for kids to show off their projects. You can pair them with a mini canvas if you want. 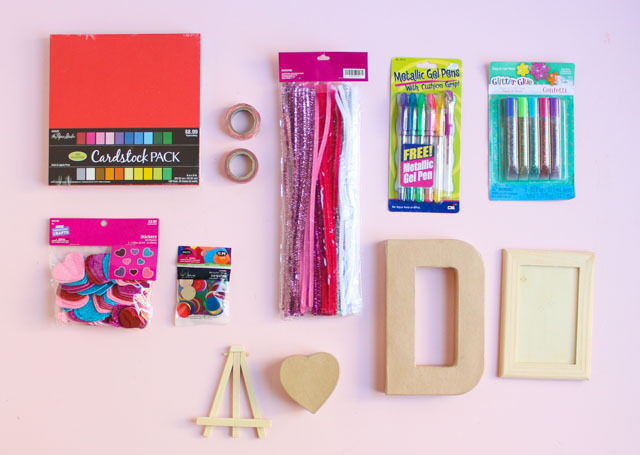 Of course this is just a start to all the cool supplies you could include in your box! 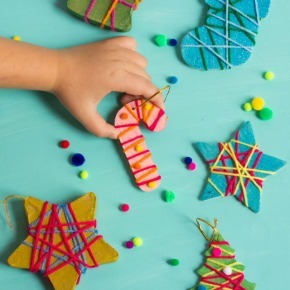 Have fun finding the perfect mix to spark your child’s creativity. Make sure to personalize the front of your supply box! I used my Cricut Explore Air 2 (currently under $200 on Amazon – the lowest price I’ve seen) to cut letters from vinyl. You can also use vinyl letter stickers if you don’t have a cutting machine. So easy! 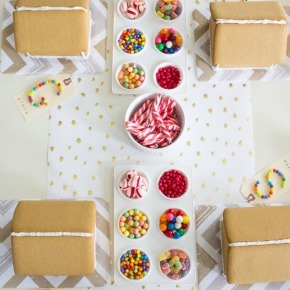 More Kids Week Christmas Ideas! 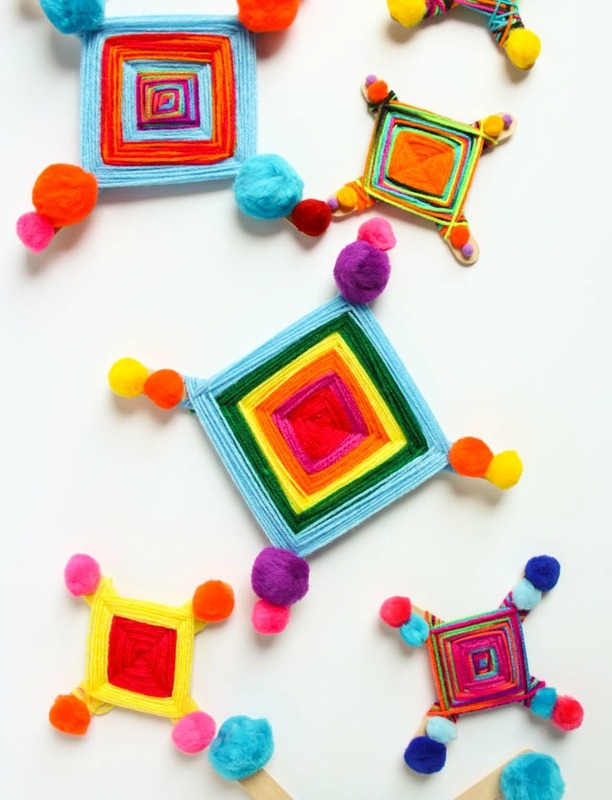 God’s Eyes: A Fun Yarn and Pom-Pom Kids Craft!